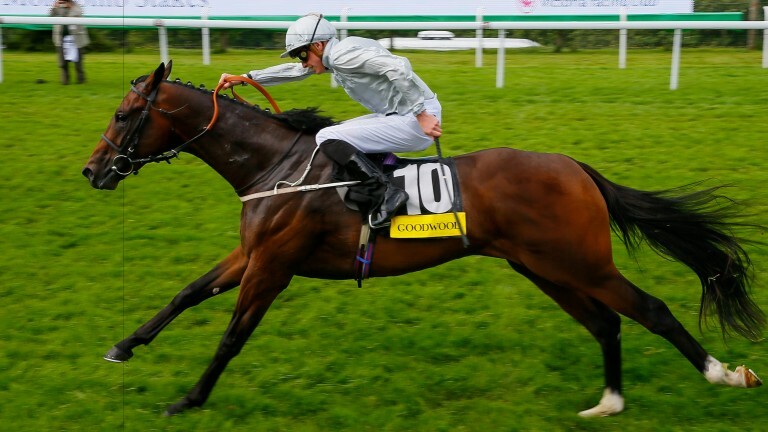 As Royal Ascot draws closer we are gradually seeing a higher calibre of two-year-old introduced to the racecourse and the 5f novice stakes at Chelmsford on Monday (5.40pm) has the makings of an informative contest. The race features the debut of two colts by outstanding juvenile sires with persuasive pedigrees, headed by Branscombe, trained by Mark Johnston for Sheikh Hamdan bin Mohammed Al Maktoum. Branscombe is by Irish National Stud flagship sire Invincible Spirit, who is responsible for two-year-old talents such as Fleeting Spirit, Hooray, National Defense, Rosdhu Queen, Shalaa and Vale Of York. He is the second foal out of the Elusive Quality mare Lacily, a 1m winner on her debut at two, making him a half-brother to Yalta, who defeated subsequent Middle Park Stakes winner The Last Lion by three lengths to win the Molecomb Stakes at Goodwood last year. Branscombe's main rival in the race appears to be Denaar, trained by Richard Hannon for Al Shaqab Racing. Denaar is a son of Acclamation, a stalwart of Rathbarry Stud who has supplied sharp two-year-olds Dark Angel, Harbour Watch, Lilbourne Lad, Mehmas and Ponty Acclaim. His half-brother Majeed excelled over middle-distances and was fourth in the Grade 1 Northern Dancer Turf Stakes over 1m4f, although he was by Mount Nelson, who tends to impart more staying power than Acclamation. Denaar must be a fine physical specimen as Peter and Ross Doyle paid 300,000gns for him on behalf of Al Shaqab at last month's Tattersalls Craven Breeze-up Sale. It will be intriguing to see how the well-bred newcomers Branscombe and Denaar fare against the Archie Watson-trained Poignant, a Sepoy colt who has fair form having finished third on his second start. On paper, the debut of a son of Dubawi out of five-length Ribblesdale Stakes winner Silkwood looks an exciting prospect. Enthusiasm for Silken Dancer – who is set to run for Charlie Appleby in the 1m2f maiden at Windsor (7.20pm) – is tempered slightly, though, by the fact he is gelded and that Silkwood has not excelled as a broodmare yet, with two winners from four runners and a Racing Post Rating of just 83 for her best offspring to date, the Oasis Dream filly Next Life. Still, with parents as outstanding as Dubawi and Silkwood – a relation to the great Miesque – it would be no surprise to see Silken Dancer make a bold show.